Photos from the 60th Anniversary Celebrations! We received the photographs from our official photographer last week and we’re uploading them to the website as fast as we can! Available now are photos from Wednesday July 5, Thursday July 6 (daytime in the Church and Church Hall only; more photos from the afternoon and evening dance to come), Friday July 7 (First Annual Celebration of Community party; photos of daytime events still to come), Saturday July 8 (more to come of the Prellies), and Grande Finale party on Sunday July 9 (more to come of the Church Service and Rose Planting ceremony). Click here for links to all the photo galleries that are available so far! Taken in St Peter’s Church Hall on the 60th anniversary of the day that two lads met, and went on to change the world! One of the most popular community groups at St Peter’s Church is the monthly singalong, that takes place on the first Wednesday of every month in the Hub. There was therefore no more perfect way to launch our Celebration of Community, and of the 60th anniversary of the day that John met Paul, than with a Beatle-themed singalong! 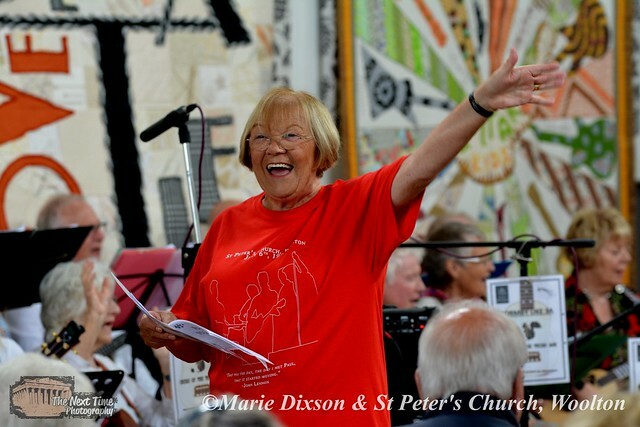 Led by Norma Townley, with fabulous accompaniment from a local ukulele orchestra, the Church Hall was packed with Wooltonians as well as visitors from around the world who sang along to a selection of Beatles songs. And, thanks to the wonder of ‘facebook live’ we had people singing along with us from as far away as Japan and the United States! As you can see, a “splendid time” was had by all! If you didn’t spot yourself in these photos, or would like to see much more of the Singalong, click HERE for the full collection of photos of the launch event for the anniversary celebrations, or click on the Flickr gallery at the bottom of this post. Relive the 60th Anniversary of the Day that John Met Paul at St Peter’s Church, Woolton! Those of you who attended our anniversary celebrations last July may have noticed Marie Dixson of The Next Time Photography hard at work at all the events. She took several thousand photos on behalf of St Peter’s and these are now ready for publication! Over the next few weeks, we’ll be posting the anniversary photos from the anniversary on this website, and reliving all five days of our Celebration of Community! As a taster of what’s to come, here’s one of our favourite photos of three of our favourite men — Rod Davies, Len Garry and Colin Hanton of the Quarrymen! We thought you might like to know that the Quarrymen are appearing in Liverpool at the Royal Philharmonic Hall on Monday afternoon, 15 Jan, on a special concert in aid of the famous Liverpool charity – The League of Welldoers. The gig starts at 2pm. Also on the bill are Mike Byrne and the Sunrockers plus a load more Merseyside entertainers so one way or another you should be in for a fun afternoon! Tickets cost £12.00 and can be obtained from the League of Welldoers on 0151 207 1984 or directly from the Philharmonic by clicking HERE!